No, it's not just a question of size. While there are many foods that go by different names in the U.S. than in the rest of the English speaking world, no linguistic dichotomy gets more attention than shrimp vs. prawns. You may have heard that shrimp and prawns are actually the same animal, just in different sizes, but this isn’t remotely true. Here are the key differences between the two delicious crustaceans. Shrimp and prawns are two distinctly different animals. Both shrimp and prawns are Decapod crustaceans, meaning they both have ten legs and possess external skeletons. However, that’s where their classification similarities end. Shrimp belong to the sub-order Pleocyemata, while prawns belong to the sub-order Dendrobranchiata. 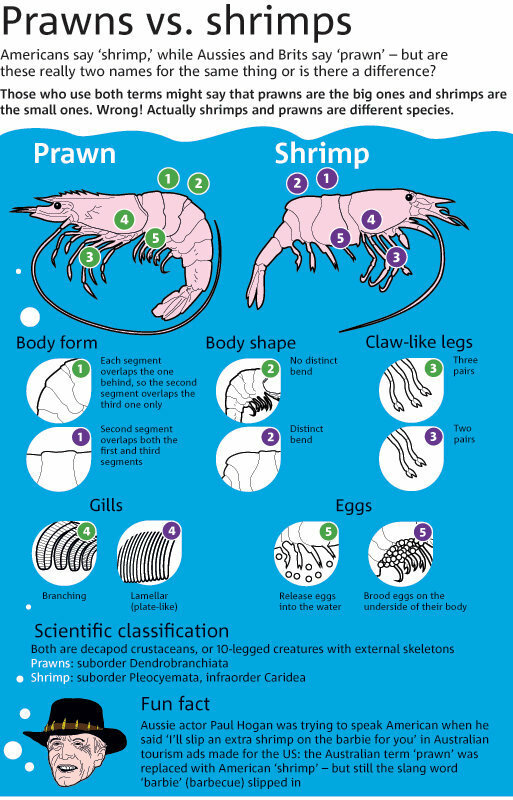 Shrimp and prawns have different anatomies. Prawns have branching gills, claws on three pairs of their legs and second pincers that are larger than their front ones. Additionally, prawns lack the distinct bend in their bodies that is seen with shrimp and each of their body segments overlaps the one behind it in succession. Shrimp, on the other hand, have lamellar (or plate-like) gills, and claws on two pairs of their legs. Their front pincers are typically their largest. Additionally, shrimp have a distinct bend in their bodies and their second segments overlap the first and third segments. Shrimp and prawns are different sizes. Shrimp are smaller than prawns in most cases. Shrimp and prawns live in different types of water. According to the FAO, in terms of aquaculture and farming, shrimp are marine creatures, while prawns live strictly in fresh water. These classifications apply specifically to the most commonly farm-raised varieties, including the giant tiger prawn and the white leg shrimp. Shrimp and prawns are not equally famous. While prawns are more popular than shrimp globally, the same cannot be said about their appearances in pop culture. In 1984, Australian comedian Paul Hogan, aka the future Crocodile Dundee, filmed an ad that promoted Australian tourism. At the end of it, he uttered the famous line, “I'll slip a shrimp on the barbie for ya,” which was changed from prawn to shrimp for American audiences. Ever since, it has been the go-to greeting for Americans meeting an Australian for the first time. The other famous shrimp appearance happened a decade later in 1994’s Forrest Gump, when the titular character learned about all of the different ways to cook shrimp from his fellow soldier, Benjamin Buford “Bubba” Blue. “Shrimp is the fruit of the sea. You can barbecue it, boil it, broil it, bake it, sauté it..."